Four COM student nurses, COM electrician Lorrin Ching and COM Police Lt. Jill Hamm helped save the life of Gary Glover, who was electrocuted, and are being recognized on Oct. 16 with the COM Distinguished Service Award. 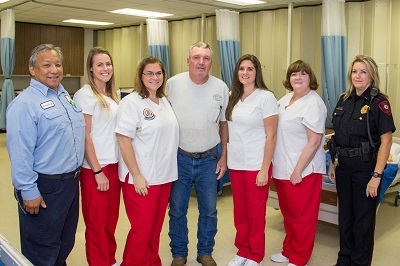 Pictured, from left, are Ching, student nurses Rachel Cunningham and Shanee Scribner, Glover, student nurses Alexis Boettcher and Andrea Strickland, and Hamm. Four nursing students at College of the Mainland, who were on break from a medical management of defibrillation cardiac resuscitation (CPR) class, jumped into action Sept. 19 when an electrician was electrocuted. The students were in the financial aid office located within the administration building about 10:30 a.m. when they saw a man in distress outside. Gary Glover, an electrician supervisor for Crescent Electric Co., who is part of a crew doing maintenance work on the Texas City campus, was electrocuted while working near a manhole cover and went into cardiac arrest. Glover, who has worked as an electrician for 35 years, was in the process of lifting a manhole cover using a crowbar when the bar made contact with a live wire. Lorrin Ching, a COM electrician who was working alongside Glover, was able to immediately roll Glover away from the energized cover by pulling on his shirt despite putting himself at risk of being electrocuted and began CPR. The four student nurses – Alexis Boettcher, Rachel Cunningham, Shanee Scribner and Andrea Strickland – rushed to the grassy area where Glover was, found he did not have a pulse and took over the compressions on Glover’s chest. Strickland called COM police on her cell phone requesting an Automated External Defibrillator, or AED. COM Police Lt. Jill Hammond arrived a short time later with an AED that is kept in the COM police cars. She followed the verbal instructions on the AED and was able to apply the pads to the man’s chest to help get his heart into rhythm. The nursing students continued with heart compressions after the AED was used and Glover eventually responded. Glover, 55, who returned to work at the Texas City campus five days later, said he remembers lifting the manhole cover but didn’t realize he had so many helping to revive him. Glover was transported by ambulance to the University of Texas Medical Branch in Galveston where he spent a few days. Ching is grateful that Glover is doing well and back at work. Hamm credits the use of the AED for being able to revive Glover. For Scribner, the day already had been traumatic before the incident. Her father, who had been suffering from liver cancer, had passed away at 3 a.m. that morning. Scribner lost her mother due to cardiac issues over the summer. The four student nurses, who are all expected to graduate in December with an associate degree in nursing, were on break from a Complex Concepts of Adult Health class taught by Deanna Machula and Debra Bauer when the incident occurred. The class usually gets a 10-minute break but on that day, the class was given a 15-minute break. With the extra time, Boettcher asked her friends to walk with her to the financial aid office. During an active shooting training earlier this year, Bauer stopped the training and insisted her students program COM’s police department emergency number on their cell phone. Cunningham said she was glad they were studying the cardiovascular system in class that day. “I actually had to call our instructor and another classmate to tell them we were going to be late coming back to class because we were doing CPR on a man that got shocked,” said Cunningham, who hopes to work an operating room nurse. Boettcher, who aspires to be a Life Flight registered nurse, concurs. “I honestly believe God put us there for him. He was blue and had no palpable heartbeat, he was going. I’m blessed to have been there for him that day. It is still unfathomable what happened but like I said, God put us there and I am so grateful Gary is still with us. The students were able to call for an AED. The students had been reviewing the specific scenario/content in class hat day. The students had been in ICU and ER for clinical rotation four days prior to the incident. “There are alignment facts that make you realize Mr. Glover had angels watching over him,” Bauer said.